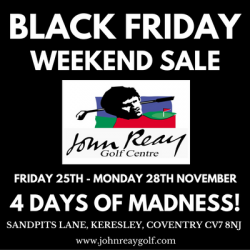 John Reay Golf Centre Black Friday Weekend Sale! Clubhouse Noticeboard : John Reay Golf Centre Black Friday Weekend Sale! Don't miss the Black Friday Weekend Sale at the John Reay Golf Centre this Friday 25th November - Monday 28th November! It's 4 days of sales madness with thousands of unbeatable deals across the store, including big money savings on golf clubs, clothing, golf bags, shoes and waterproofs!